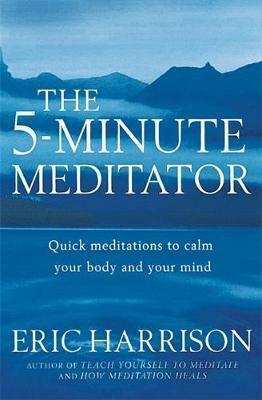 I have finished a book written by Eric Harrison and titled The 5-minute Meditator, I like it a lot. It is the perfect book for people who ‘have no time to meditate’. The book has about a dozen ‘spot meditations’ lasting from half a minute to five minutes. Short meditations are just as effective as long ones, that suits me perfect since it is easier for me to do several short meditations than a long one. Meditation is about choosing where you direct your attention. If you focus on something that is simple and sensual, you relax. The basic instructions are: focus on the sensations of the present – sight, sound, taste or touch – and let your thoughts pass by in the background. Eric writes that just a few minutes of deep breathing each day can make a difference to our well-being. I do a simple practice of three deep breaths that works very well for me. You do not have to make yourself relax. You just stand back and let it happen. Meditation is the art of doing nothing. Your body and mind will naturally settle if you give them half a chance. The less you try to do, the better it works! To stay in the present, focus on one thing in the present. We call this the meditation object. It is your anchor, it is what you persuade your mind to return to when it wanders away. One thing to focus on is our breath, easy and always available. Eric mentions that a visual object can be much easier to focus on than the breath so your mind is less inclined to wander. The choice is yours, pick an object that is available and do a short meditation. I work as a coach and I use a short meditation before sessions to unwind, relax and become focused on the session to come. It helps me become more present. Posted on March 23, 2008 by BengtPosted in Body Mind SpiritTagged Books, Meditation, Mindfulness, Review, Zen-related. Previous Previous post: The rest of your life?